• How will the market for single family homes change over the next 5 years? • How does economic prosperity in this metro compare to others? • What are the patterns in metro rental income and rental vacancy rates? 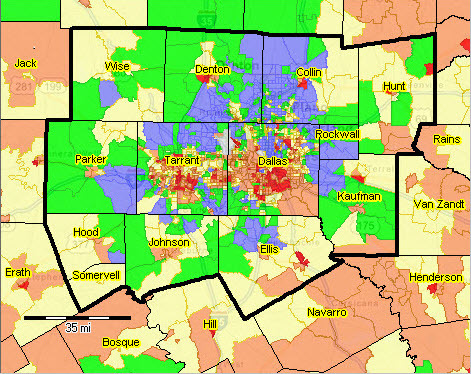 • How do patterns vary within the metro by county/neighborhood? We examine these types of topics in this section. Stakeholders can replicate applications reviewed here for this and other metros. Select any metro. .. this section now continuously updated … see Dallas Metro Situation & Outlook; see related Texas Demographic-Economic Characteristics. This section is focused on the Dallas-Fort Worth-Arlington, TX MSA; Core-Based Statistical Area (CBSA) 19100. It is not intended to be a study of the metro but rather review recent and trending decision-making data that can be brought together to examine patterns and change and develop insights. The data, tools and methods can be applied to any metro. – See a more detailed version of this document focused on this metro. 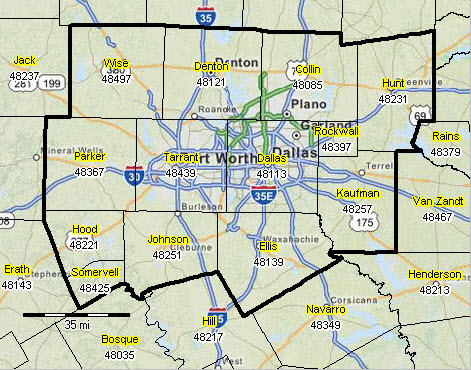 The Dallas-Fort Worth-Arlington, TX MSA is shown in the graphic below. 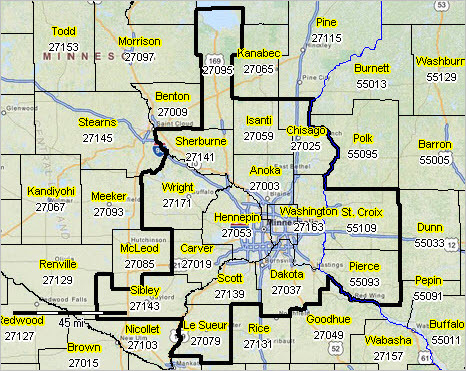 The 7-county metropolitan statistical area is shown with bold boundary; counties appear with black boundaries and county name/geographic code labels. Click graphic for larger view and details. Map developed using CV XE GIS. Click graphic for larger view and map legend. Map developed using CV XE GIS. 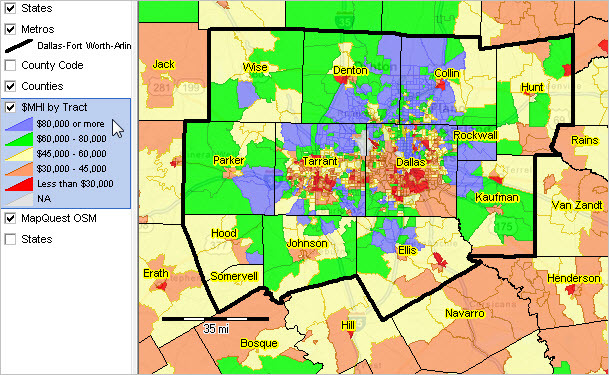 Develop variations of this map view using the Mapping Texas Neighborhood Patterns GIS resources. This metro is home to 40 Fortune 1000 companies including AT&T, American Airlines, Comerica, Dean Foods, Exxon Mobil, Fluor Corporation, J.C. Penney, Kimberly-Clark, Lennox International, Michaels Stores, Neiman Marcus, RadioShack, Southwest Airlines, Tenet Healthcare and many others. 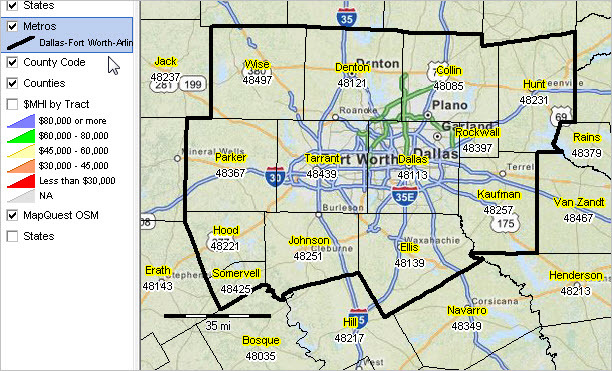 The total population of the Dallas-Fort Worth-Arlington, TX metro changed from 6,452,725 in 2010 to 6,954,330 in 2014, a change of 501,605 (7.77%). Among all 917 metros, this metro was ranked number 4 in 2010 and 4 in 2014, based on total population. Annual net migration was 62,320 (2011), 77,089 (2012), 57,645 (2013), 74,176 (2014). View annual population estimates and components of change table. This metro is projected to have a total population in 2020 of 7,418,541. The projected population change from 2010 to 2020 is 965,816 (15.0%). The population ages 65 years and over is projected to change from 592,695 (2010) to 1,031,937 (2020), a change of 439,242 (74.1%). See more about population projections. Based on per capita personal income (PCPI), this metro was ranked number 61 in 2008 and 76 in 2014. among the 917 metros for which personal income was estimated.The PCPI changed from $44,697 in 2008 to $49,506 in 2014, a change of $4,809 (10.8%). Per capita personal income (PCPI) is a comprehensive measure of individual economic well-being. Use the interactive table to compare PCPI in this metro to other metros. 282 metropolitan statistical areas, of the total 381, experienced an increase in real Gross Domestic Product (GDP) between 2009 and 2014. This metro ranked number 5 among the 381 metros based on 2014 GDP. The GDP (millions of current dollars) changed from $355,756 in 2009 to $504,358 in 2014 a change of $148,602 (41.77%). Real GDP (millions of real, inflation adjusted, dollars) changed from $355,756 in 2009 to $460,154 in 2014, a change of $104,398 (29.35%). GDP is the most comprehensive measure of metro economic activity. GDP is the sum of the GDP originating in all industries in the metro. Join me in a Data Analytics Lab session to discuss more details about this metro, comparing this metro to peer group metros and use of data analytics to develop further detail related to your situation. .. December 2015; updated monthly … current, monthly data on the employment situation are essential to assess recent trends. The only historical source of these data for all metropolitan areas, counties and sub-county areas is the Bureau of Labor Statistics (about these data). The civilian labor force, employment, unemployment and unemployment rate are estimated monthly with only a two month lag between the reference date and the data access date (e.g., February 2016 data are available in April 2016). Historical monthly seasonally adjusted and non-adjusted time-series data are available. Use tools and resources provided/described in this section to access and analyze these Local Area Employment Situation (LAES) data. See related Web page with interactive ranking table. The following graphic shows the unemployment rate by metro. 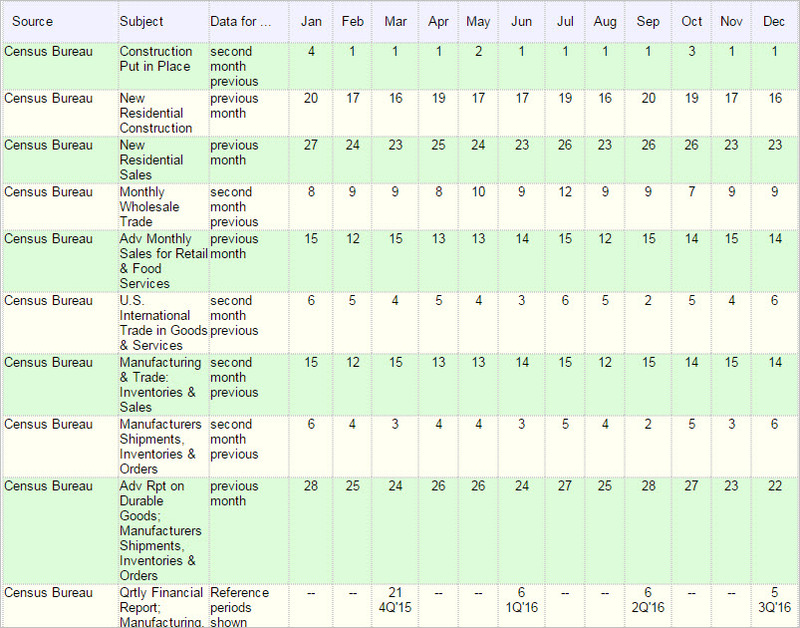 The Metropolitan Area Situation & Outlook Reports provide a labor market characteristics monthly time-series table. Select a metro using this interactive table. 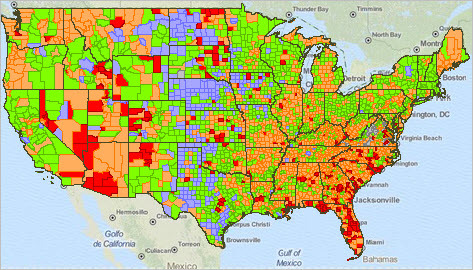 Examine the labor market data in context with wide-ranging related demographic-economic data. Use the CV XE GIS software and LAES GIS project to create thematic pattern maps and integrate the employment situation data with other data. ProximityOne User Group members may install the LAES GIS Project at no fee and prepare thematic pattern maps like the one shown above and below. The map shown below shows the unemployment rate for each CBSA for a year earlier than the above map. Compare the maps and see how patterns have changed. .. effective use of information in anticipation of data releases .. The Federal statistical system uses scheduled release dates for wide-ranging statistical data. Anticipation of the implications of the data by users builds ahead of the actual release date. This section reviews major statistical release dates to help stakeholders “stay ahead of the data” and be prepared to make better use of the data. The continuously updated Statistical Release Dates for 2016 table can be a useful reference throughout the year. Each month, stakeholders around the world watch for news about the Jobs Report, the Employment Situation, data developed by the Bureau of Labor Statistics. The Employment Situation is one of many key economic measures used to assess the strength and direction of the U.S. economy. Many, convinced that the November data would be good news, took action in advance of the actual data release. The New York Times December 4th story “The U.S. economy created 211,000 jobs in November … The numbers did not disappoint … U.S. stocks jumped more than 2 percent … Stocks rallied in a sign investors are taking their cue from economic performance …” The Jobs Report is but one of many with monthly implications for planning and decision-making. Planning in advance of the statistical release dates can often be as important as taking action based on what the numbers actually say. Upon the actual data release, a CEO might ask, “what do these data mean for our company and what might be the impact on us?” Good opportunities might have passed by that time. And, in the face of less positive news, the opportunity to take action might have passed. See the full 2016 calendar. The graphic below shows a partial view of the 2016 data release dates. Items include selected key Federal and other demographic-economic statistics and related geographic data. The list builds on the list of “Principal Federal Economic Indicators” prepared by OMB. That list was developed in part to prevent early access to information that may affect financial and commodity markets and preserve the distinction between the policy-neutral release of data by statistical agencies and their interpretation by policy officials. – click graphic to view full table. Each row in the table shows dates for data releases. The table will update throughout 2016 and knits together with the ProximityOne calendar. The “Staying Ahead of the Data” section in the Metropolitan Area Situation & Outlook Reportsreviews upcoming data releases and anticipates the possible effects on that metropolitan area. This section is focused on the Minneapolis-St. Paul-Bloomington, MN-WI MSA; Core-Based Statistical Area (CBSA) 33460. It is not intended to be a study of the metro but rather illustrate how relevant decision-making information resources can be brought together to examine patterns and change and develop insights. The data, tools and methods can be applied to any metro. 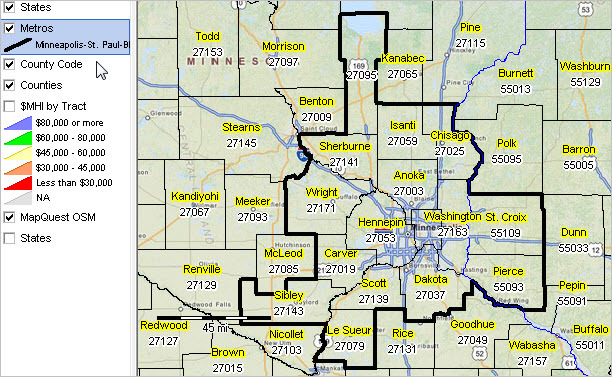 The Minneapolis-St. Paul-Bloomington, MN-WI MSA is shown in the graphic below. 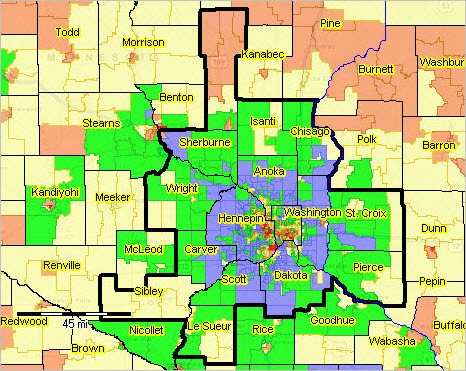 The 20-county metropolitan statistical area is shown with bold boundary; counties appear with black boundaries and county name/geographic code labels. This metro is home to Fortune 1000 companies including 3M Company, Ameriprise Financial, Best Buy Co., General Mills, Inc., Land O’Lakes, Inc. and many others. The total population of the Minneapolis-St. Paul-Bloomington, MN-WI metro changed from 3,355,105 in 2010 to 3,495,176 in 2014, a change of 140,071 (4.17%). Among all 917 metros, this metro was ranked number 16 in 2010 and 16 in 2014, based on total population. Annual net migration was 10,659 (2011), 10,100 (2012), 13,897 (2013), 10,762 (2014). View annual population estimates and components of change table. See more about population characteristics below. This metro is projected to have a total population in 2020 of 3,698,877. The projected population change from 2010 to 2020 is 343,772 (10.2%). The population ages 65 years and over is projected to change from 372,335 (2010) to 603,936 (2020), a change of 231,601 (62.2%). See more about population projections. Based on per capita personal income (PCPI), this metro was ranked number 37 in 2008 and 44 in 2014. The PCPI changed from $47,956 in 2008 to $53,166 in 2014, a change of $5,210 (10.9%). Per capita personal income (PCPI) is a comprehensive measure of individual economic well-being. Use the interactive table to compare PCPI in this metro to other metros. 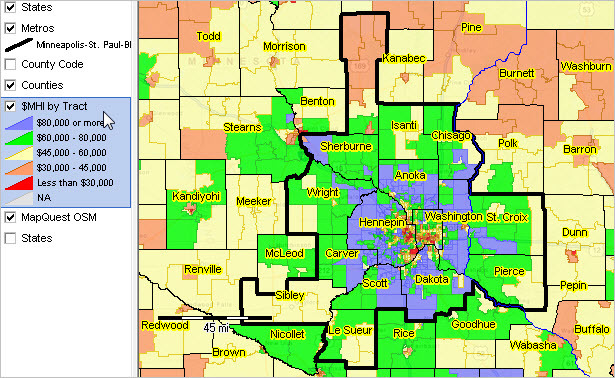 The following thematic pattern shows a measure of economic prosperity (median household income: MHI) by census tract. Develop variations of this map view using the Mapping Minnesota Neighborhood Patterns GIS resources.